Jugglo.com is the top supplier of light up LED light glowing juggling balls. For night juggling turn on your LED juggle balls and experience glow in the dark juggling. We Ship everywhere! To USA Canada Australia France Europe UK Japan Germany Holland and more! Glow ball juggling is the coolest way to night juggle We sell all your Night Sports Toys in one place! The future of glow balls is here with light up LED glow juggling! Finally a light up juggle ball! New Strobe LED takes glow juggling into a whole new world of juggle art Fantastic rave gear Easily create a crowd and amaze your audience and friends by glowing night juggling! A great addition to any show or routine Glow juggle and let the magic begin! Light up Jugglo Glowing Juggle Balls are the new next level of LED light glow juggling. Now available The New Jugglo Pro 70mm Ball. A professional glowing juggle ball that will change juggling forever! Click on a link below to see our other amazing glow products. Turn on Jugglo Juggle Balls for the best glow juggling experience you could ever imagine! Jugglo 70mm professional and original glowing juggle balls provide hours of glow juggling fun. 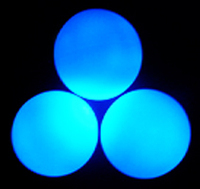 The original and best glowing juggling balls available. USA shipping is $8.00 for Air Mail (5-10 days) for any size order. Canadian customers $12 for Expedited shipping. (5-8 days) Orders have dollars at par + applicable tax. Night Juggle! Wow the fans!! Impress everyone! Take Juggling into the future! The Future of Fun! New Low Prices! A set of 3 slowly color changing Jugglo Pro Glowing Juggling Balls! 7 Color Fade Jugglo Pro light up glowing juggle balls contain the latest in LED technology! Our amazing new LED lights slowly fade and blend through 7 different colors! The new tough LED lights spend a few seconds on each color and then slowly fade into the next color. Red to yellow to green to blue to turquoise to purple to white and everything in between! The newest and coolest glow juggle ball effects available! You get a set of 3 Jugglo Pro Juggle Balls with 7 color fade lights. The Jugglo Pro glow juggle ball is 2.75 inches in diameter (or 70mm) and weighs 5 ounces. The batteries are included (last 40+ hours) and are replaceable. You truly have to see it to believe it! Watch your Pro LED Jugglo Balls change color before your eyes! The latest in LED light technology takes juggling to a whole new planet. The new LED light spends a fraction of a second per color on 7 different constantly changing colors! Red, yellow, green, blue, turquoise, purple and white with no black space between colors! Take your juggle art to the next level! This juggle show leaves them breathless! You get a set of 3 Jugglo Pro light up juggle balls with color changer lights. The Jugglo Pro glow juggle ball is 3 inches in diameter (or 70mm) and weighs 5 ounces. The batteries are included (last 40+ hours) and are replaceable. A forever changing Juggle show! 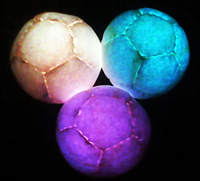 Set of 3 Professional Amara Suede LED Juggle Balls!! The New Jugglo 12 Panel Suede LED juggle ball is a treat for your eyes and your hands! The panel Jugglo ball is 3 inches in diameter and weighs 100 grams. Soft to the touch and a joy to juggle. Available in all colors. If you would like a custom color combination just email us! You get 3 Jugglo 12 panel juggle balls with LED lights and batteries. The batteries are the same as the Jugglo Pro batteries and last 40+ hours and are replaceable. Amaze everyone everywhere! Juggle with the new Jugglo 12 panel LED Juggling balls! Amazing fast strobe LED light enters juggling into a new dimension! Strobe Light Sets contain amazingly fast flashing LED strobe lights. They take glow juggling to a different dimension. When in motion the Jugglo Pro Strobe light flashes very fast on and off like a strobe light with a red/blue/green hue. 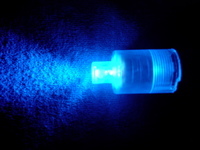 The Strobe light creates bright tracer lines with flashing ghostly effects. It's a juggle ball that's a strobe light! You get a set of 3 Jugglo Pro Juggle balls with Strobe lights. The Jugglo Pro light up glow juggle ball is 2.75 inches in diameter (or 70mm) and weighs 5 ounces. The batteries are included (last 40+ hours) and are replaceable. The Jugglo Pro Strobe Light Set, it's new and unbelievable! Sets of 7 Color Fade, Strobing or 7 Color Changing Professional Glowing Juggle Balls! Incredibly fast glowing LED Strobe lights, 7 Color Changing lights and 7 Color Fade lights create an unbelievable glow juggling experience. You get a custom set of 3 Jugglo Pro juggle balls with your choice of lights! The Jugglo Pro light up glow juggle ball is 2.75 inches in diameter (or 70mm) and weighs 5 ounces. The batteries are included (last 40+ hours) and are replaceable. Jugglo Pro Glow Strobe Sets, they're new and unbelievable! Mix up a set for new amazing glowing possibilities! Set of 3 High Quality Professional Glowing Juggle Balls! 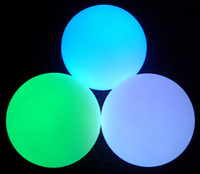 Get our great new 70mm glowing juggle balls all the same color or mix the colors up! You get a set of 3 Jugglo Pro juggle balls with your choice of solid colors! All the same or all different! Amazing to watch and so fun to glow juggle! Blue SetGreen Set White Set Pink Set Purple SetOrange SetRed Set Red+Blue+Green Red+Green+White Purple+Red+Blue Red+White+Blue Pink+Orange+Turq. Purple+Blue+Green Blue+Green+Turq. Order A Different Color Light For Your Jugglo Pro Balls! Jugglo Pro and Atom Ball lights are interchangeable! Buy an extra light and make your favorite Jugglo Juggle Ball glow a different color! Lights can be used as mini flashlights, necklace lights for bike riding and walking or for finding friends. You get 1 LED light module, hard plastic container, 3 batteries and a twist on/off cap. Just change over the Jugglo Pro light modules and your Jugglo light up Juggle Ball is glowing a new color! Buy extra batteries for your new Jugglo Pro Juggle Balls! Order extra batteries and save money! We buy bulk and pass on the savings to you. 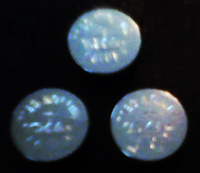 Three AG12 button cell batteries are needed for 1 Jugglo Pro ball in all colors. Jugglo Pro battery packs last 40+ hours per ball! Three battery packs will be needed for your set of 3 Jugglo Pro juggle balls. We are so proud to have so many happy customers all over the world! Thank you for your feedback! The best glow juggle balls i have ever bought, and i'm a pro, they feel the best and are very durable, thank you very much. C.B. I recieved my glow ball's very fast. Wow what fun they are! G.J. I LOVE LOVE LOVE the Jugglo Strobe Light Up Juggling Balls!!!!!!!!!!!!!! D.P. These balls are great! Love the purchase, good price, and excellent shipping! A.C. Fantastic product. Good value. K.Z. They are great! Thank you!!!!! -Z.C. my boyfriend loved them!!!!!!!!!! - D.G. Good communication. Item arrived exactly as described. Excellent transaction. -C.M. Got it! Great store. Thanks a bunch!! AAAAAA+++++++ -F.J. Awesome! Thank you! Quick shipping - exactly as described! A+A+A+ -H.B. Very, very, very cool!!! Thanks A+++++++++++++++++++++++++ -H.D. Once more PERFECT, really good items these balls!!! Thx so much. -A.L. Smooth and quick transaction. Very good to deal with. A + -R.C.